Willamette Falls Heritage Area Coalition estimated that the City would have to contribute about $300,000 for its end of the renovations. 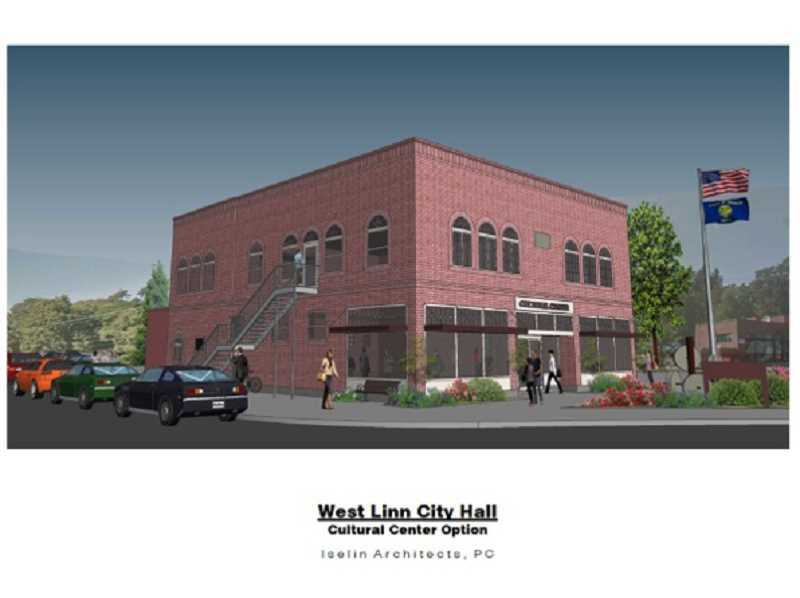 Representatives from the Willamette Falls Heritage Area Coalition (WFHAC) made their intentions clear when they appeared before the West Linn City Council Nov. 13 to discuss the City's old city hall building. "What we'd like is a letter of intent from the City of West Linn to financially engage in a partnership (with us) by December 2018," WFHAC Executive Director Siobhan Taylor said. The future of the vacant building — which sits adjacent to the Arch Bridge and most recently was used as the West Linn Police station — has been in limbo since January, when Clackamas County Tourism & Cultural Affairs (CCTCA, also known as Oregon's Mt. Hood Territory) withdrew a proposal to move into the building and provide significant funding for needed repairs. CCTCA said the City was too slow in its decision-making process when the organization had an "extremely urgent" need for new office space, and WFHAC hoped to avoid a similar fate this time around. WFHAC — which has spent years working to create a National Heritage Area around the Willamette Falls — hopes to essentially take on the role that CCTCA would have played as the leader of a group of nonprofit organizations that would work in and help manage the building as a new "cultural center" in partnership with the City. According to Taylor, WFHAC would pledge $150,000 for improvements at the building, and an additional $100,000 remains available through a grant from CCTCA. However, CCTCA recently informed the City that it had until February to decide if that grant funding would be used, or the organization would pull it and move the funding into another project. "We've got $100,000 in (grant) funding, our organization's commitment for $150,000, but we need a commitment from West Linn," Taylor said. "If we can come before you with $250,000, we'd hope West Linn could at least come up to get us in on the main (first) floor, get it renovated so we can have exhibit space." WFHAC — along with other possible partner organizations such as the Willamette Falls Heritage Foundation, the Clackamas County Arts Alliance and Rediscover the Falls — envisions a first floor cultural center with exhibits and interpretive installations that could tell visitors all about the riverfront area. "(You could have) a Locks Museum ... a Willamette Falls Heritage Area exhibit, a Grand Ronde cultural exhibit," Taylor said. "This could be the starting point for tours — walking tours, bus tours ... people could come in and be welcomed at the visitor center right on the first floor." The second floor, meanwhile, would be used for office space and community meetings. "We could move (upstairs) without having to do much," Taylor said. "We're kind of nomads. We go from place to place. This would give (the groups) a place to call home and share resources." The group estimated that the City would have to contribute about $300,000 for its end of the renovations. After voters approved a $20 million general obligation (GO) bond last May, the City set aside about $2.5 million to be spent on city-owned facilities, including the old city hall. If WFHAC and the City arrive at an agreement, WFHAC envisioned the project progressing in three phases. The first phase would be to improve the building to a "functioning level" by 2020. The nonprofits would start operating the cultural center in 2020, and further improvements to "fully restore" the building would take place in 2021 and 2022. "This will be a shot in the arm for citizens of West Linn to see something positive happening with that building," Taylor said. "It does not forestall future development. If anything, it helps. It offers a gateway for residents and visitors and investors." The four councilors who were present at the meeting — Council President Brenda Perry called in, and Councilor Bob Martin was absent — said they supported the spirit of the proposal, but some were more concerned than others about potential pitfalls. "We've got a lot of details to work through, and I still keep coming back to parking," City Councilor Rich Sakelik said, adding that he also preferred that the entire building be dedicated to historical elements as opposed to using the second floor for office space. "(A letter of) 'intent,' we could do, but 'commitment' based on future potential is hard to do. I don't want to go forward with something that in the future isn't plausible because of changing conditions." The City controls about 20 parking spaces on Mill Street next to the property, and West Linn Paper Co. also recently installed metered parking spaces on property it owns nextdoor to the old city hall — though the long-term future of the mill property remains unclear. "This is part of a bigger vision, and I think parking can be worked out," WFHAC representative Jody Carson said. "It's just that we won't have definitive answers by tomorrow — it would be by 2020. We can't tell you today how many parking spaces, and where they will be." WFHAC member Jim Mattis addressed the concerns about how the cultural center might affect future investments on the waterfront. "You're not foreclosing any future development that might happen down there," Mattis said. "But it can be the start of what we all hope will be a huge thing." Sakelik said he would be comfortable with a "soft" letter of intent, assuming that would be enough to ensure the City keeps the $100,000 grant from CCTCA. "I'm perfectly happy to do a letter of intent that doesn't hold either of us bound," he said. "We've allocated $2.5 million (in GO bond funds) for city facilities, and haven't had any firm discussions on where we want that to go, and old city hall is part of that." Mayor Russ Axelrod, who is a member of WFHAC, felt the City shouldn't pull any punches in its support for the effort. "It's part of the City's vision. We're a partner in this — it's our building," he said. "I'm ready to sign a hard intent to commit to this building." "What I was hearing Councilor Sakelik say is that there's some things we have to know, and we have a duty for due diligence," City Councilor Teri Cummings said. "But I think your organizations can bring life into this building in a way we can't." In the end, the council opted to have City Attorney Tim Ramis draft a letter of intent for both parties to evaluate at a later date.